Many Central College students arrive never having shared a room. That changes quickly—by design. Four pairs of roommates who ended up best friends talk about what they gained in the process. 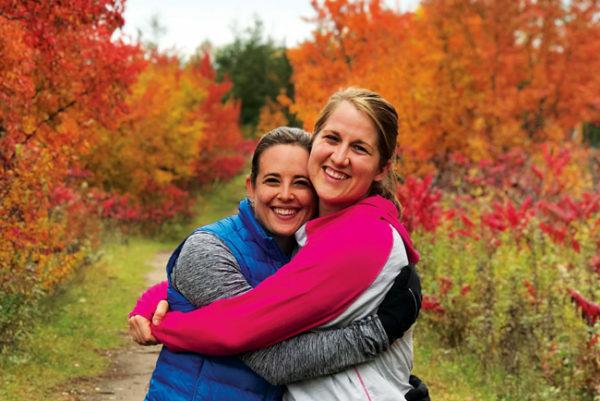 Allison Redman Westfall ’13 and Sarah Rankin Folkerts ’13 were wary strangers when they moved into Graham Hall together. 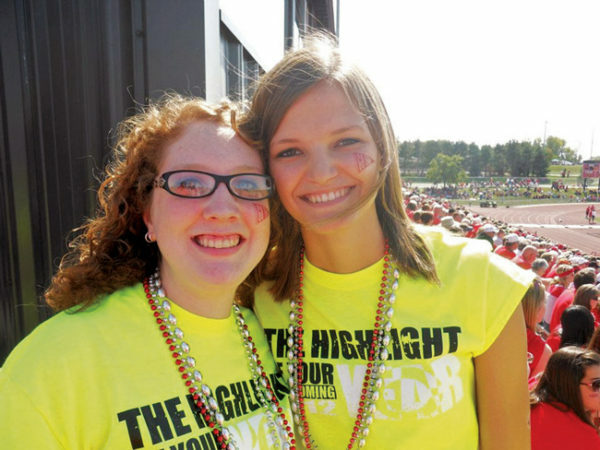 Roommates Alison Redman Westfall ’13 and Sarah Rankin Folkerts ’13 at a Central College Dutch football game during their student days. Now the two have husbands and live 160 miles apart. That hasn’t stopped them from celebrating graduation with a Florida vacation or participating in each other’s weddings. After Folkerts gave birth, Westfall visited her best friend in the hospital. Roommate bonding takes on a new meaning when it starts with living without a shower. Just ask Stephen Fyfe ’87 and Brian Boersma ’87. Pre-shower grumbling was common, Fyfe says. Perhaps it prepared them for later camping trips. About 10 years after graduating and while starting families, Fyfe, on a whim, proposed a camping trip—with kids but sans wives, to give the latter a break from childcare. Experiences included retreating to a minivan when the tent flooded and fending off a raccoon that clawed its way in for a bite of Jaarsma Bakery hamburger buns. 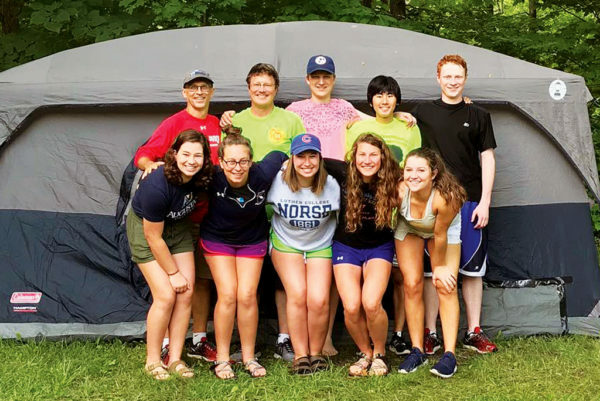 Former roommates Stephen Fyfe ’87 and Brian Boersma ’87 on a recent camping trip with Tim Boersma, high school exchange student Tsukasa Yano, Josh Boersma, Rebekah Fyfe, Abby Fyfe ’18, Rachel Fyfe, Claire Boersma and Stephanie Boersma. The first trip involved three kids under age 5. Today, those three are out of college. They still come to roast s’mores, listen to Boersma tell stories around a campfire and talk late into the night. Vance housemate Pat Davis ’86 occasionally joins them. After sharing a room, standing up for each other at their weddings and yearly outdoor adventures, there isn’t much the two haven’t shared. Not much says “trust” like showing your first-year roommate your hidden knife collection. Melanie Hopkins ’12 had embraced Abby Lukensmeyer Bobst ’12 as one of her best friends already, but it’s still nice to know when your roommate has a knife stash. During the first days on campus, highly organized Bobst printed Hopkins a copy of her schedule, in case of emergency. “I told her, ‘Abby, I will literally never use that!’” Hopkins says. Things were awkward. But it quickly dissipated. Sarah Paulson ’12, Katie Kepford ’13 and Regan Jamieson Minaudo ’13 with Bobst and Hopkins during a 2017 get-together. Bobst and Hopkins traveling together during their study abroad semester in Granáda, Spain. 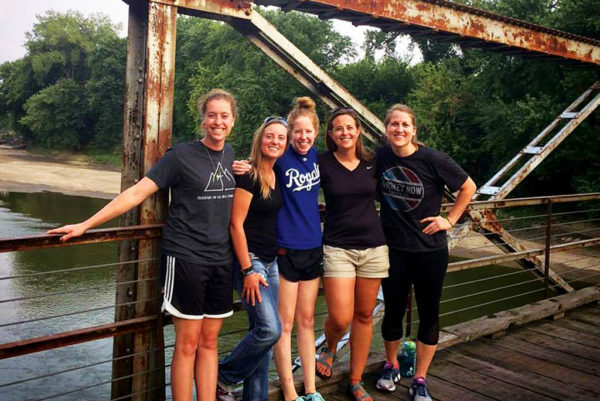 The pair has hiked Red Rock’s cliffs, ventured to Earlham and Hampton, Iowa, Hopkins and Bobst’s respective hometowns and consumed rivers of Smokey Row shakes — “the ones with espresso in them!” Hopkins says. 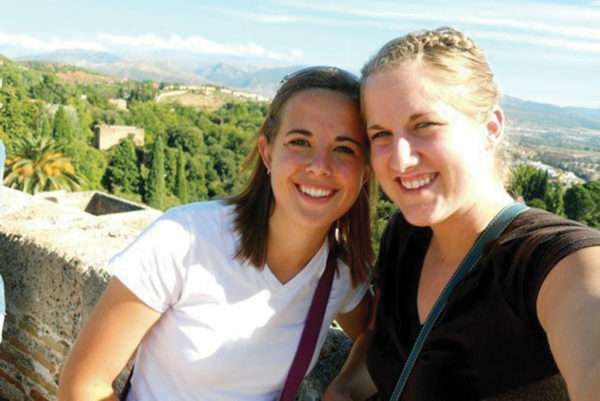 They also studied abroad together in Granáda, Spain, a highlight of their friendship. Now, the pair, along with Paulson, Regan Jamieson Minaudo ’13 and Katie Kepford ’13, get together during their self-proclaimed “#MonthofFriendship” each September. They have road-tripped from the East Coast into Canada, hiked Longs Peak in Colorado and even were part of Minaudo’s wedding during “their” month. What do you do when you hit it off with your roommate so well that you’re loathe to part at graduation? You don’t. Rick Williamson ’15 and Grant Seuferer ’14 were randomly assigned as roommates, but you wouldn’t know it. “I transferred in as a junior and didn’t know anyone, so I took a chance,” Seuferer says. That “chance” lasted six years. Seuferer and Williamson after completing the Dam to Dam half marathon. 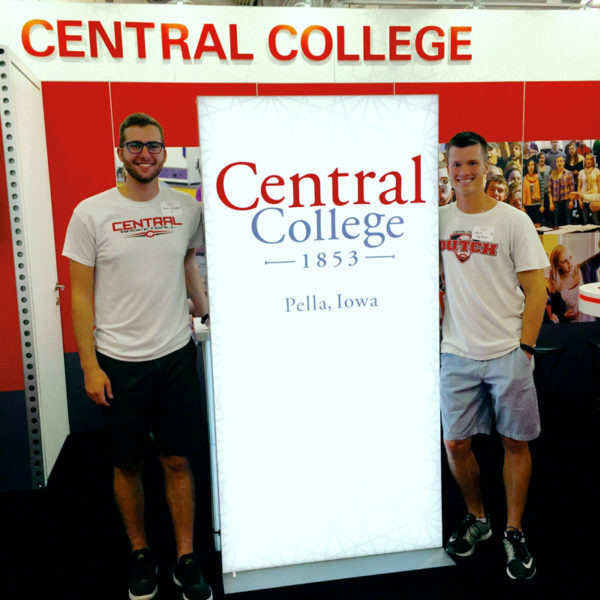 Roommates Rick Williamson ’15, left, and Grant Seuferer ’14, right, volunteering at the Central booth at the Iowa State Fair. 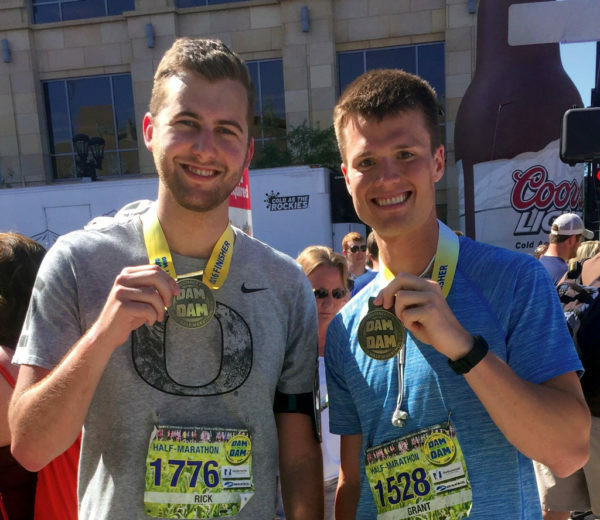 As students, the duo competed in gennis, intramurals and video games. Their intense rivalry seems to have cemented their friendship. They even challenged each other to will themselves awake to view Seuferer’s final CPA score (Williamson fell asleep minutes before it was released, and hasn’t lived it down). Despite always finding a way to oneup the other, they are thankful Central brought them together. The two are still close—literally. They live in the same apartment building in Des Moines just a few doors down from one another. Fegley’s favorite roommate memory? “Celebrating Central game wins with friends by watching Monty Python and sharing homemade chili and ice cream,” he says. “We also played rounds of winter golf around campus in the snow—our generation’s version of gennis (golf played with a tennis ball, now popular on campus),” he says. 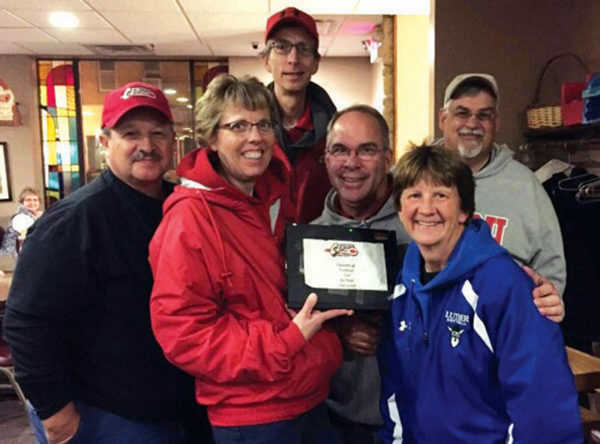 Left to right: Mark Stauffer ’80, Lori Fegley ’80, Larry Happel ’81, Al Wather ’81, Diana Stauffer, Brian Fegley ’80. Another great memory is running around campus to find the keys of my wife [then girlfriend], Lori Humphrey Fegley ’80,” Fegley says. 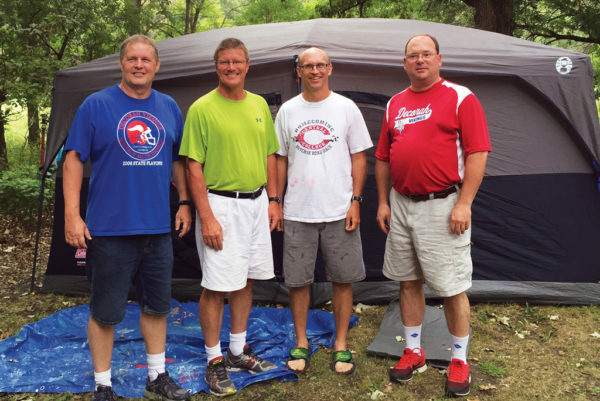 “Mark and Larry Happel ’81, (Central’s longtime sports information director) absconded with them and sent us on a treasure hunt. We finally found them on the island. Did you know flip flops get stuck in the mud at the bottom of the pond?” Fegley says the memories are great, but he most values learning a different approach to life. 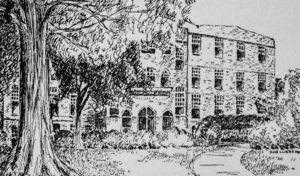 Graham Hall, built in 1918, was first called “the dormitory” and initially housed only women—plus the college’s dining hall and laundry in the basement. The building later was named for Elizabeth Graham, an English professor (1905 – 1914) and dean of women (1914 – 1932). The hall switched genders during World War II when it was occupied by Navy cadets. 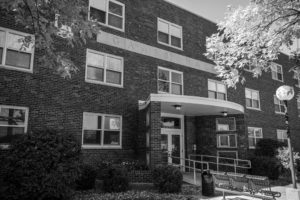 It since has been heavily updated, with capacity at 151 students, and is now the only all-female residence hall on campus. Gaass Hall is named for longtime Central supporter and former board member (1957 – 2002) Peter Gaass ’39. It was state-of-the-art when built in 1951 and originally housed 167 men in 80 rooms—each equipped with $300 worth (that’s nearly $3,000 in today’s money!) of contemporary Carrom Company furniture. To qualify for these luxe accommodations, men agreed to live by certain standards: no profanity, beds made by noon and no women allowed after 7 p.m. Gaass was modernized and switched to coed living in the mid-1990s thanks in part to Eric Jones ’87, director of academic resources and class dean. Pietenpol and Hoffman Halls, built in 1961 and 1964, respectively, are Central’s only remaining all-male residence halls. Pietenpol Hall (“Piet” for short) houses 96 men and honors Dean Henry W. Pietenpol. Hoffman Hall, named for former Central president (1917 – 25) Rev. Milton Hoffman, houses another 47 men—and features balconies in the common areas. 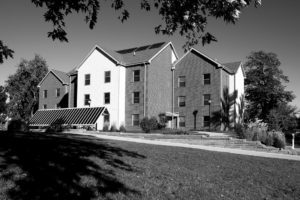 Before a major renovation in 2000, hall residents were limited to one room arrangement: the furniture was fixed to the walls. Scholte Hall bears the name of Pella’s founding father, Dominie Pieter Scholte. The 330-student residence hall is the college’s largest, built in three sections from 1964 – 1969 and became coed shortly thereafter. The building got a $7 million update—including air conditioning—in 2008. 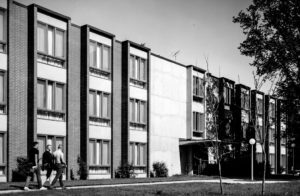 Starting in 1970 with Mentink, named in honor of Central professor of Latin and Greek Herbert Mentink, townhouses became a haven for upperclassmen. Fourteen were built over the next three decades—including six in 1972 and three in 1988. Firth is the newest and only one to be built in the 21st century. Townhouse sizes vary but hold an average of 32 students. Townhouses initially offered independence to honor students; residents had to maintain a collective GPA level. 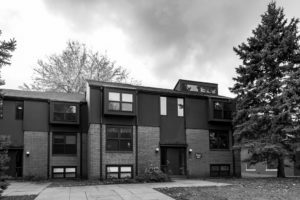 The honor designation has been shed, but the coed townhouses are self-governed, making them popular with upperclass students. Howard McKee Hall is named for Howard Alexander McKee ’38, a generous Central benefactor. 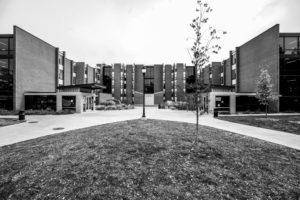 It was built in two phases in 2003 and 2005 and is affectionately known as “The Pods.” Primarily for upperclass students, it features individual apartment-style living units comprised of four bedrooms, two bathrooms, laundry and a common area for up to 120 students. McKee reflects Central’s commitment to sustainability. The building is Gold LEED rated, with solar energy and water-saving features. To encourage serious, intellectual discourse on Civitas, please include your first and last name when commenting. Anonymous comments will be removed.